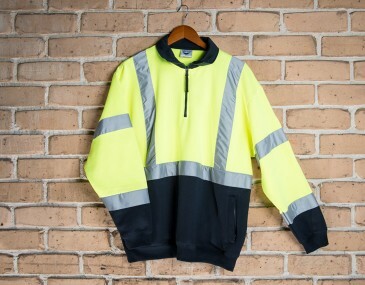 This high visibility Fleecy Jumper is designed for comfortable wear in winter conditions. The 80 percent polyester, 20 percent cotton combination permits a sturdy, durable fit that will keep you warm and last through multiple wash and wears. With a double loop and a striking parallel line design for the reflective tape, this high visibility jumper won't just keep you warm, it'll help keep you safe as well.